Ah the kicker. Some leagues don't even bother with them anymore, but if you are reading this, I can only assume your league still uses them. It's often hard to predict how kickers are going to perform, but a good week from your kicker has probably won you a few matchups. With that in mind, here is a look at some kickers that should be looked at for Week 8. Ka'imi Fairbairn hasn't been the biggest stud kicking-wise, but the explosion of the Texans' offense will give him a decent opportunity in Week 8 against the Seahawks. The Seahawks are a tough defense, but meet a Deshaun Watson led Texans team, who has been lighting it up so far this season. With a good offense meeting a good defense, it isn't a stretch to think some drives will stall in field goal territory. Fairbairn has been clutch when needed. 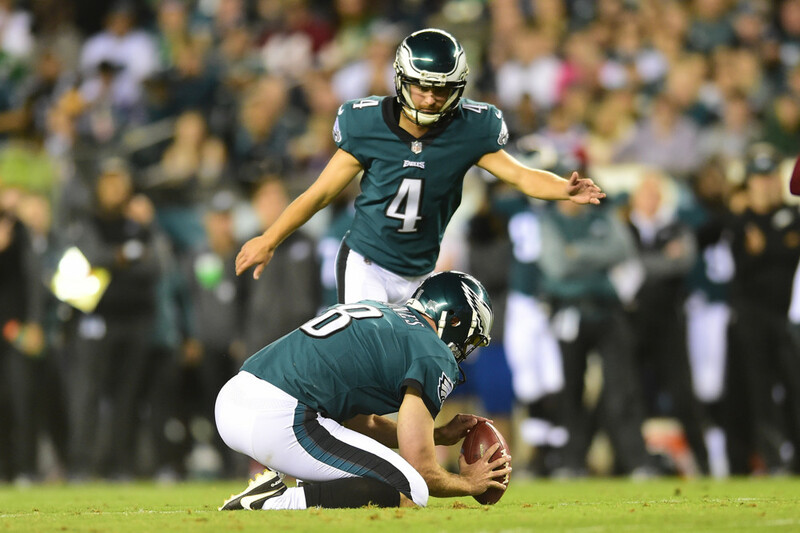 Jake Elliott has been another surprising newcomer to the kicking world, hitting 82% of his field goal attempts. This may not seem crazy good, but what he lacks in accuracy he makes up for with a big leg. Elliott has hit 7 forty plus and 4 fifty plus field goals, with a personal best 61 yard field goal to beat the Giants in Week 2. The Eagles take on the San Francisco 49ers in Week 8, who have allowed the 4th most points to kickers. Continuing the rookie kicker sensation list, Harrison Butker has been solid for the Chiefs since taking over in Week 4. Butker has hit 93% of his field goals (his only miss coming in his first game), most of them coming from between 30-50 yards. Butker is on a high powered offense (who would have guessed), but meets the stingy Denver Broncos' defense in Week 8. As mentioned above, a good offense plus a good defense should equal plenty of field goal opportunities. The Chiefs are also at home. Wil Lutz will be at home with the Drew Brees led Saints in Week 8, and will face a solid Chicago defense that currently ranks 18th in points allowed to kickers. Wil Lutz has been decent this year, hitting 81% of his field goal attempts. It's never a bad idea to have the kicker for a team that scores a lot of points, as is evident in Lutz's double digit point average. Lutz should see plenty of opportunities in Week 8. Randy Bullock is more of a flyer kicker this week, facing the team that has allowed the most points to kickers so far: the Indianapolis Colts. Bullock has been good so far for the Bengals, hitting 87.5% of his attempts. The Bengals have been pretty lackluster on offense lately, so it's not crazy to assume Bullock will get some chances after drives stall. If you are looking to take a flyer on a kicker (you crazy person you), Bullock is worth a look.